Hey, that tastes good! : Little pies, or if you want, galettes. Little pies, or if you want, galettes. Give me a hunk of dough, a pile of flour, and a rolling pin, and I'm a happy girl. I love working dough, I love rolling it out, I love making a mess. I love coaxing dough to do the right thing, and then when it comes out perfect, it's so satisfying. This crust I made the other day for the knishes is like that. It isn't like a gluten-free dough at all. You can work with it, roll it out, form it into things, and not only is it simply the best, flakiest crust I've ever had, it's gluten-free. Many of my favorite desserts are made from rolled out doughs, mostly, I love pie. LOVE pie. I have made some decent pie crusts in the past, but they pale to this one. It's fast, easy, and, quite simply, perfect. Last night I didn't want to make a whole pie. I didn't think I had enough fruit for a fruit pie, and I didn't want to make a custard or overly sweet pie. So I settled on making mini pies. Ones you can hold in your hand and eat while you're walking, and not make a big sloppy mess of yourself. And what a good idea! I am spending a lot of time thinking a lot about what kind of food I'm going to bring on my epic 27-hour journey to Chicago next Friday. I've got some ideas, and some basics, but no desserts yet. And I really can't think of anything I will enjoy more than eating little mini pies on the train. I will have to make them again on Thursday next week, since the little pies I made yesterday will be gone by tonight. I had to fight Alex to get him to not eat anymore last night after dinner. They're perfect. The crust is the most perfect crust I've ever made. It's flaky, buttery, tender, easy to work with, and simple to put together. Alex says it's perfect, and he eats gluten. You can really put anything you want into these pies. I made them square, because I had spent the previous hour making dumplings (which I will post about when I have a real recipe, this time I used the funny Ha Cao mix that I love because it makes the best dumplings I've ever had) and didn't want to cut out any more circles. Next time I will make little halfmoons. You can make any shape you want. I didn't have enough dough so I made a galette with the last bit of dough. Really, they're so perfect. I can't say it enough. I filled half of mine with blueberries, my favorite pie fruit, and the other half were dolce de leche and apple pies. The best part, besides how easy and delicious these are, is that they can be vegan! The dolce de leche I made is vegan, and the crust can be. I've been having some trouble adapting my recipes to gluten-free AND vegan, for my vegan friends. I don't like to have people over and then not be able to feed them some amazing dessert. This is it, guys. The best gluten-free, vegan dessert possible. In the bowl of your food processor, mix the flour, xanthan gum, and salt and sugar. Add the butter and pulse, until crumbly. Mix together the seltzer and vinegar, and pour in by tablespoons, until dough comes together. If you use all the liquid, and the dough feels too sticky, just dump it into a bowl, add about another tablespoon of flour mix, and work it into the dough until its smooth. Divide the dough in half, flatten on floured (with rice flour or sweet rice flour) pieces of wax paper into two disks, sprinkle with more flour, fold up and stick in the freezer while you prepare your fillings. Mix together everything in a pan with high walls (unless you want to be scrubbing your stove for a while afterwards, like me), and heat over medium heat until sugar is dissolved. Let cook for about an hour, stirring occasionally, until reduced by half. This should take about an hour. Be careful because it's going to splatter. Once its reduced, pour into a glass jar that you've run under hot water for a minute so it's not cold (or it will break). Let sit for about half an hour, then pour off the oil that's risen to the top. Store in the fridge and use for things like pies or ice cream or eating with a spoon out of the jar. Cut the apple into really thin slices. I left the skin on. You don't have to. Preheat the oven to 350. Roll out one dough disk pretty thin (it's tough dough, it can handle being stretched thin), and cut out a few rectangles, about the size of a small index card (3x5?). Put the rest of the dough aside to be reused. Wet the edge of one rectangle, then plop about a tablespoon of blueberries in the middle. 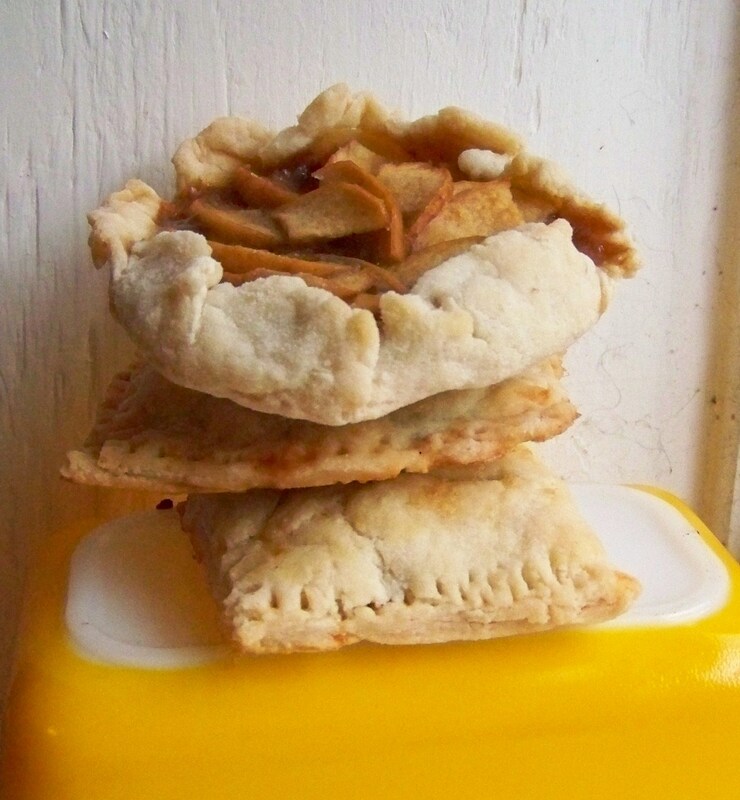 If you're making caramel apple, spread half of the dough with caramel, and then lay apple slices carefully over it, making sure that there's enough dough on the other half to cover the apples, and trying not to get any caramel around the wet edge where you're going to seal the pie. Once filled, fold the unfilled top over and press around the edges carefully with your fingers, or a fork. Lay the finished pie on a cookie sheet with parchment paper or a silpat, and repeat until all dough is gone, rolling out the dough again to make more rectangles. You can make mini galettes instead, which will make a lot more since they use less dough. After you roll out the dough, cut fairly large circles out of the dough. Put enough filling to cover the middle, leaving about an inch around the edge to fold over. Carefully fold over edges. Place on your cookie sheet, and repeat. Once you have all your mini pies (I got about 8 palm-sized pies), brush them with milk (I used Silk), and then sprinkle with large-grain sugar. Bake for about a half an hour, until golden on top and slightly brown on the edge. Be careful not to let them burn! Let cool enough so you don't burn your tongue, and eat. 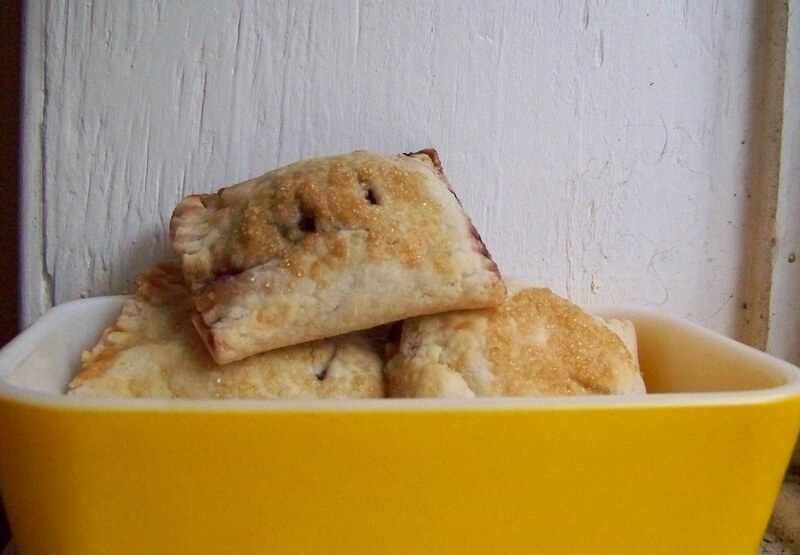 Store any leftover pies in the fridge. Thanks! They ARE so good. It's taking all my willpower not to eat them all for breakfast! Looks awesome! what flour mix are you using? It's posted in the 'flour mix, important info' link on the top of the page! Hi, I am excited to try this pie crust recipe for Thanksgiving, my first without gluten. Do you think I can get away with making this the day before, or is the crust like most gluten free backed goods, and should be eaten the day it's made? Jennifer - In my house there's only two of us, so obviously we didn't eat these all the day I made them. They were fine the next day (and a day after and maybe for a few more). I think it should be fine! Let me know how it turns out!! that pie crust looks divine! I can't wait to try it. I've tried 2 different GF pie crusts, and both were BIG flops! 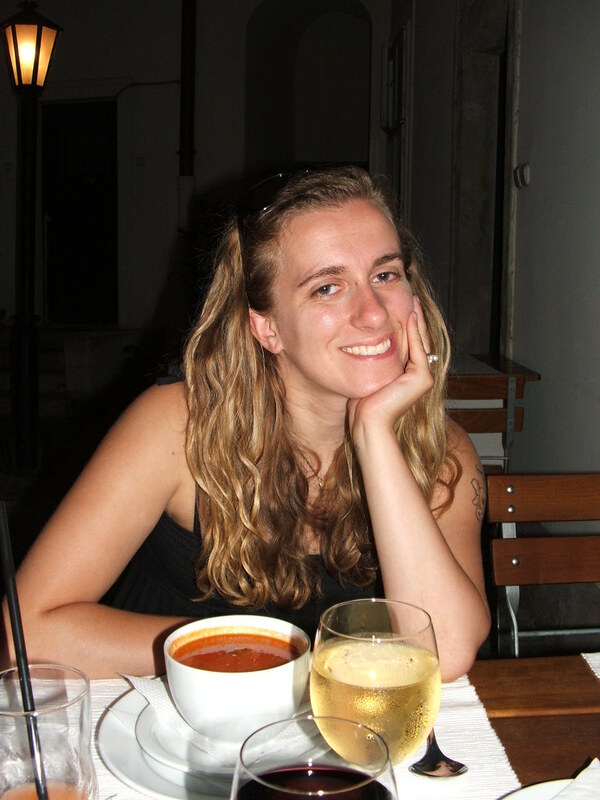 Hi Jill Elise, great blog! We found it when we googled 'vegan, gluten free crumble'. How much is a stick of Earth Balance over there? We have a vegan butter alternative here but it's not in sticks. And is selzer, sparkling water/soda water? I would LOVE to try making this pie pastry! Ta! A stick of earth balance is the same as a stick of butter, which is 8 tablespoons or 1/2 c. Seltzer is soda water - carbonated but not sweet! Thank you, thank you, thank you! I was so afraid I would never make a gluten free pie crust that would be delicious, and now I have! Instead of using it for T-giving, I just baked a clam chowder pot pie with this recipe doubled for a two crust pie. It is absolutely delicious! Thanks J.E, I will deffo be trying this crust! I've been digging through your site and have found so many fabulous recipes and have found lots of inspriation. I think we have the same baking bug...I have been in the kitchen all day. It seems I just can't help myself. The receipe is unbelievable!! I have made it three times and every time it is perfect. I have even served it to non GF friends and everyone loves it! This recipe worked out so well! I thought all my years of pie making were over. The dough was easier to work with than my old gluten filled recipe, and it tasted incredibly delicious. do you have any suggestions for a great pie crust? Oh gosh Nikki, I don't have a clue. Can you have nuts? Maybe a nut crust? "allergic adventures, meet hey that tastes good! i only JUST started baking, and your two blogs have been my "go to" place. I have so many of Rylee's allergies, and also have to do a rotation diet, and the galettes were my FIRST attempt at a crust.. ever. it went so successfully! i added some amaranth to the crust, for a crunch, and used them for mini pot pies. i used silicone cupcake cups, and i could pop out the whole pie when i was done, and the next day, i tossed my sweetie one on his way out the door. a pot pie, for lunch! thank you to both of you so much! how does the prepared (but unbaked) crust hold up the refrigerator/freezer? What's your advice on preparing a bunch ahead of time to save for a later bake?